The EU stated that it “takes note” of the resignation of the Prime Minister Serzh Sargsyan following eleven days of protests against his rule and that they “applaud” the peaceful nature of the changes. 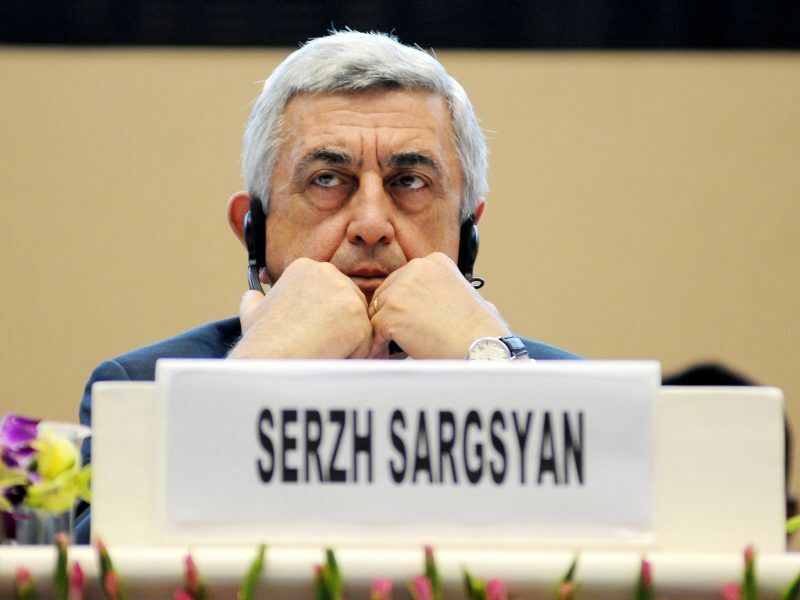 Armenian Prime Minister Serzh Sargsyan said on 23 April he would resign to help maintain peace in the ex-Soviet republic following daily street protests since before he took up the post on 17 April. Armenian Prime Minister Serzh Sargsyan said on Monday (23 April) he would resign to help maintain peace in the ex-Soviet republic following daily street protests since before he took up the post on April 17. In a statement published yesterday (24 April), the Delegation of the European Union to Armenia and EU member states’ Embassies in Armenia also said it was “imperative that the current situation is resolved swiftly and peacefully”. “A national dialogue involving all political stakeholders remains crucial”, they added. In the meantime Armenian opposition leader Nikol Pashinyan yesterday said he was ready to lead the country. “Yes of course we are ready to lead our country,” Pashinyan said at a news conference in Yerevan, after being asked whether he was willing to steer the government of the ex-Soviet South Caucasus country. “If people will bestow on me this responsibility, I’ll assume the responsibility,” Pashinyan said. According to Armenian law, lawmakers in the parliament, where Sargsyan’s Republican Party have a majority, have a week to propose new candidates for PM and could hold a vote on 2 May. A meeting due to take place Wednesday between Pashinyan and acting head of government Karen Karapetyan to discuss the transfer of power was cancelled, a spokesman for Pashinyan said yesterday night without giving further details. The new prime minister must be a “people’s candidate” and not a member of Sargsyan’s ruling Republican Party, he stressed. The events coincided with the annual commemoration of the Armenian genocide. Earlier Tuesday, tens of thousands of Armenians marched to commemorate million and a half of Armenians were killed by Ottoman forces during World War I.
Clutching a purple rose, the bearded Pashinyan, 42, led a huge crowd of supporters to the hilltop Tsitsernakaberd memorial, wearing his trademark khaki-coloured T-shirt, where he held official commemorations. Karapetyan appealed for unity after the wrenching political turmoil in a country locked in a simmering territorial conflict with Azerbaijan. “We are going through a difficult new phase in our history,” he said in a statement. Russia — which has a military base in Armenia — appealed for stability but said it would not interfere. “If someone names me a pro-Western or pro-Russian it will be a misunderstanding. I am pro-Armenian,” he said. Many Armenians said they felt mixed emotions because the impoverished country’s future was uncertain. “I’ve been thinking from the start of the day that everything is just beginning,” said Asya Bagdasaryan, 43. Armenia — which depends on investment and aid from Russia — has been hit hard by economic troubles in its former Soviet master. Unemployment stood at 18% last year. The opposition says some 290,000 people have left the country since Sargsyan came to power in 2008. 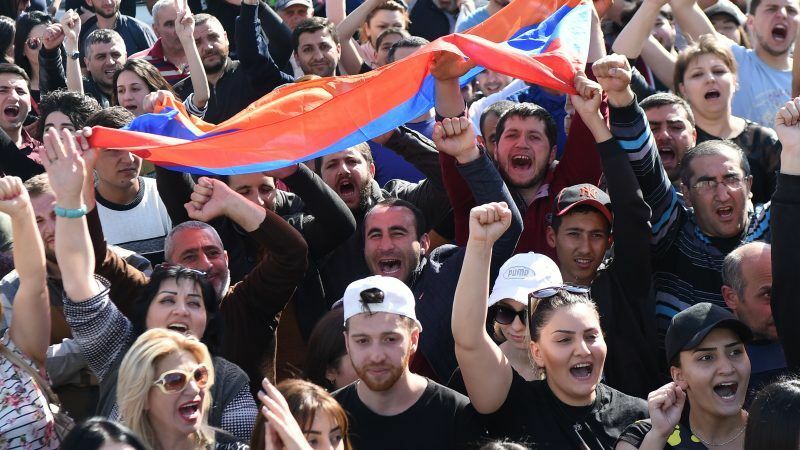 Political turmoil enveloped the landlocked country of 2.9 million people after Sargsyan was elected prime minister by lawmakers after serving two successive presidential terms. he opposition charged that the 63-year-old wanted to extend his grip on power under a new parliamentary system of government, saying he failed to tackle poverty and corruption. Protests broke out several days before his expected election, with tens of thousands of people eventually taking to the streets of Yerevan and other cities in largely peaceful protests. Sargsyan initially refused to resign but quit on the 11th day of demonstrations after a number of serving servicemen joined the marches. Kremlin spokesman Dmitry Peskov expressed hope that the country’s new leader would suit “all forces representing the Armenian people”. A spokesman for Azerbaijan’s foreign ministry said he hoped that new Armenian authorities would adopt a “constructive” approach over the breakaway region of Nagorny Karabakh. The European Parliament published a joint statement by the MEPs in charge of EU-Armenia and EU-Azerbaijan relations, as well as of the foreign affairs committee, reminding that a lot is at stake from the developments in Yerevan. “In the coming weeks, the European Parliament is due to vote on whether or not it should give consent to the Comprehensive and Enhanced Partnership Agreement (CEPA) with Armenia, as well as an in-depth accompanying resolution on the state of EU-Armenian relations. In this context, we would like to emphasise the extent to which the current events in Armenia are the subject of close attention in the European Parliament, especially the numerous arrests of peaceful demonstrators including parliamentarians”, MEPs Sajjad Karim (UK, ECR) and David McAllister (Germany, EPP) state. The two MEPs did not shun from using the term “genocide”, which is sometimes avoided by other politicians more complacent to Turkey. “While today marks the anniversary of the 1915 Genocide, in which they lost 1.5 million of their kin, we urge all Armenians to show unity and to resolve their political differences in a peaceful manner, within the framework of their Constitution”, Sajjad Karim and David McAllister conclude.